Joshua Tree is where two deserts meet. 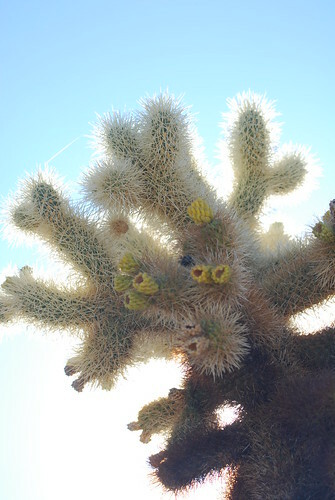 The south is the Colorado, the driest desert in the US, home of the massive Teddy-Bear Cholla cactus. The north is the Mojave, dotted with the eponymous joshua trees - giant lillies. At the bottom of the Pinto Basin is what the national park labels a "Cholla Garden", where hundreds of spiny armed cacti reach up to the bright bright desert skies. 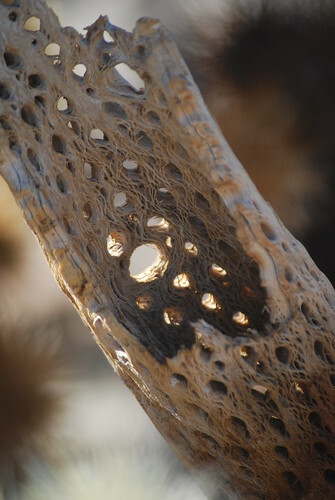 Under the spiny skin is a wooden mesh framework, where it stores water for the long dry months. 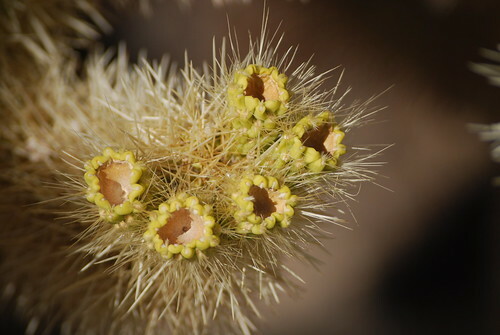 The cholla reproduce by dropping off arms that root and grow another new plant. Most of the time the yellow fruit have no seeds - it's only rarely that they're fertile. Next time, I'm going to go in spring to see the flowers. I speak from experience: they're spectacular. Bloody hell those are good pictures, even by your standards. I'd say thanks, but the model did all the work. Joshua Tree is stunningly beautiful, and everywhere you look you see something new and wonderful. It's one of my favourite places, and like Yosemite, like the Grand Canyon, like Zion, it's one of those places that transcends the hype.